While axes have more traditional uses; like chopping lumber, learning how to throw an axe is surprisingly fun, and an urban sport that is trending across Canada and the United States. You may also want to learn how to throw an axe in preparation for a zombie apocalypse or simply to learn a new skill. Rule #1: Don’t throw an axe if someone is in front of you or near the target. Keep a clearance area of at least 6 feet surrounding the target. Rule #2: Don’t sharpen the blade too much to the point where you can cut yourself. If it’s as sharp as a knife, you overdid it and sharpened the blade too much. It’s important to learn how to properly grip the axe. It’s best to throw the axe with two hands. Pick up the axe and place your dominant hand on top of your other hand. Keep a firm grip and make sure the blade is straight and not leaning to the right or to the left. Keeping the blade straight will help your aim when you release the axe. Once you’ve mastered the two handed throw you can upgrade to the one handed throw. Remember to keep that blade straight! There are various axe throwing techniques, ranging from basic, advanced and even trick shots. Below is a 3 step instruction for basic axe throwing technique. Step 1 – Start with two hands and that firm grip. Make sure the blade is perfectly straight and take aim for where you want to hit the target. You can either stand with your feet shoulder width apart or staggered with one in front of the other. Step 2 – Bring the axe directly over your head and slightly lean back. Step 3 – Lean forward and release the axe in a fast motion extending your arms forward. Once you are comfortable with your basic throw, you can move up to the advanced axe throwing technique. Step 1 – Take aim and visualize your target. With one foot forward, swing your arm down to the side and a little past your leg. Step 2 – In a quick motion, bring the axe up. Step 3 – Once the axe gets over your head, bring it forward like throwing a ball. Step 4 – When your arm is parallel to the ground, release the axe towards the target. Urban Axe Throwing is a safe, monitored and fun environment for amateurs or self proclaimed lumberjacks to learn to throw axes. Professional axe throwing coaches at Bad Axe Throwing can teach you how to throw an axe, conduct fun games and host a competitive tournament to crown a champion. Urban axe throwing has become a premier destination for adult birthday parties, bachelor/bachelorette parties and team building functions! 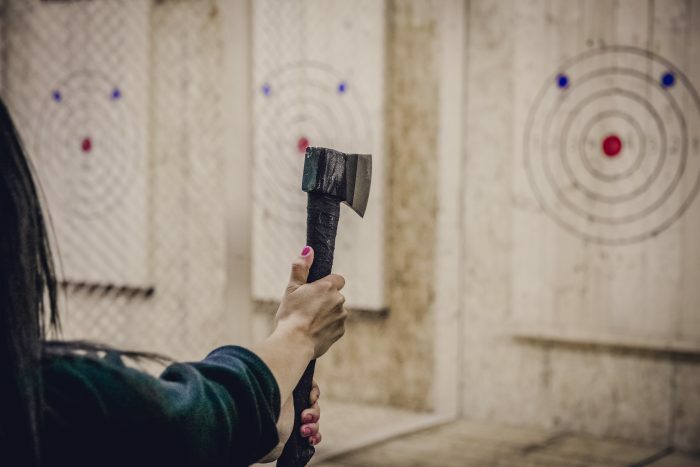 See how sharp your axe throwing skills are by booking an event at a facility near you!